Star Wars and sequential art share a long history: Star Wars debuted on the comic-book page in 1977, when Marvel Comics began publishing a six-part adaptation of the first film, which morphed into a monthly comic book. Now, more than three decades later, new series by Dark Horse Comics continue to expand the Star Wars galaxy. The second book in the Star Wars Art series, Star Wars Art: Comics brings together the very best artwork from the entire history of Star Wars comics publishing, showcasing original art from the top comics artists working in the industry. Hand-selected and curated by George Lucas, the art featured in this volume includes interior pages and fully painted covers from artists such as Al Williamson, Howard Chaykin, Adam Hughes, Bill Sienkiewicz, Dave Dorman, and many more�as well as new work created exclusively for this book by over 20 renowned artists, including John Cassady, Sam Kieth, Mike Mignola, Paul Pope, Frank Quitely, Jim Steranko, and other comics superstars. 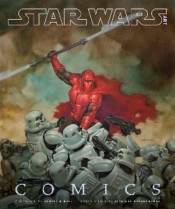 Star Wars Art: Comics is a tribute to sequential storytelling, a worthy and justly celebrated art form.